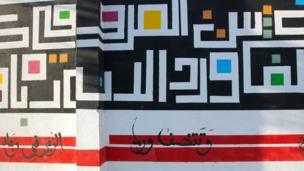 A Tunisian artist has turned a prison wall into a symbol of hope for young people coping with unemployment and political turmoil in the central city of Kasserine. 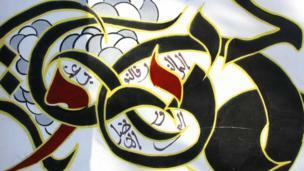 Street artists Karim Jabbari is hoping to revive and modernise the ancient art of Arabic calligraphy in Tunisia. 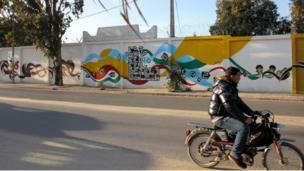 He painted this 250 metre (270 yard) graffiti mural onto the wall of a prison in his home town of Kasserine. 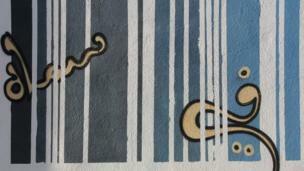 The playful, ever-changing motifs stand in stark contrast to the barbed wire on the top of the prison wall. 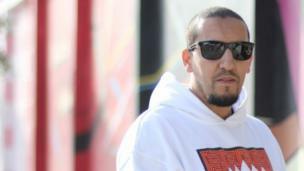 Jabbari, 35, has a signature style that mixes traditional Arabic calligraphy traditions with an edgy, urban aesthetic. 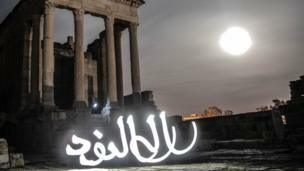 Jabbari's work includes light calligraphy, as pictured here at the Roman amphitheatre in the city of Sbeitla. Light calligraphy is created by using long exposures to capture the movement of a torch with a digital camera. 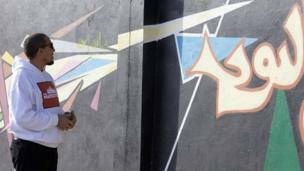 The torch acts like an airbrush, with the public space as a canvas. He is passionate about engaging young Tunisians in deprived towns like Kasserine, where youth unemployment remains stubbornly high. 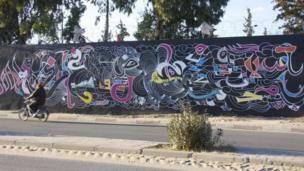 The street mural was created with young local artists like 19-year-old Saif (left) and 17 year-old Ayoub. “Initially my friends were sceptical,“ says Saif. "But then they joined me, because they liked what we were doing." Jabbari experiments with two of the oldest calligraphy styles: Kufi and Maghribi. Maghribi (above) means “Western” in Arabic and refers to the Islamic world of North Africa and Spain, where this script was developed in the 10th Century. Kufi is even older and dates back to the 7th Century. Working on a prison wall has a particular resonance for Jabbari. 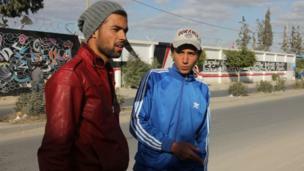 His father Abdallah, an Islamist, opposed the government ousted in the 2011 revolution. 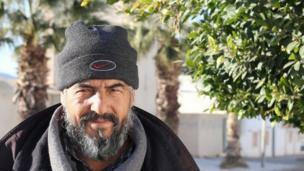 The family was persecuted for their political beliefs and tried several times to leave Tunisia. Eventually, Abdallah was jailed. He spent two years behind these very prison walls, now a local landmark. "My father had horrible experiences in prison. It's a part of his life I want to forget. I can't bring myself to talk to him about it," says Jabbari.